The first ever Food Truck Rodeo & Music Festival rode into Stamford on June 20th, and a large crowd shrugged off the rain to get their grub on. More than twenty food and beverage trucks ringed Mill River Park, offering a diversity of selections ranging from BBQ, to pizza, Caribbean food, donuts, tacos, lobster rolls, pierogies, and grilled cheese. The coffee truck seemed to be doing a good business on a warm, drizzly day, but visitors were just as likely to be seen with a cup of beer from Blue Point Brewery in one hand and frisbee in the other in the Rodeo's beer garden. 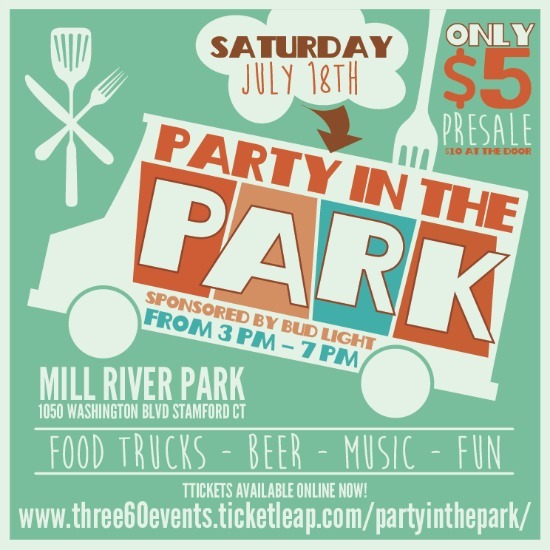 Anyone who missed the Rodeo will get a second chance on July 18, when the food trucks and music return for Party In The Park. Advance tickets are $5, and double to $10 at the door. Stamford's otherwise booming nightlife seems to come to a screeching halt when the bars close for the night, and late night eating options are very few and far between. I'd encourage the city and the crew at Three60 Events to look at making a food truck night market a regular staple of Stamford after dark - 1a.m. tacos have to be better for people than 1a.m. rides to Port Chester, right?